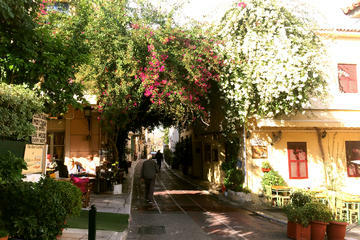 Agora Square is situated at the intersection of Aiolou and Adrianou Streets, marking the location of one of the most important ancient landmarks of Athens. 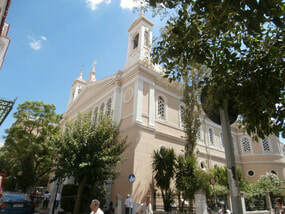 The square is defined by Aiolou Street, the ancient commercial street Adrianou, Kapnikareas Street, leading to the historic church of Kapnikarea on Ermou, and to relatively unknown Kalogrioni Street. Here, on Agora Square, the visitor can take a rest under the trees with a beverage at of the many cafeterias or have a Greek specialty in one of the surrounding restaurants. The Acropolis, as seen from Agora Square. There is no museum nearby. Numerous choices to relax at. There are several restaurants and cafes on the square. Agora Square and places to relax. Adrianou Street at Agora Square. The Agora was a central location in ancient Greek city-states. The literal meaning of the word is "gathering place" or "assembly". The agora was the center of athletic, artistic, spiritual and political life of the city. 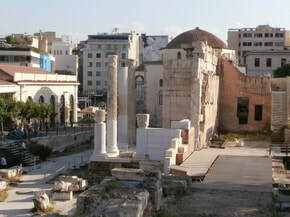 The Ancient Agora of Athens was the best-known example. Agora Square takes its name because of its proximity to the location of both the original and the Roman Agora of ancient Athens.